The Griffin label will include three recordings made in Hampton Court Palace, and this one I particular is ideal for release just before the main foreign tourist season begins in the UK. Since the worldwide success of the film “Shakespeare in love”, as well as the BBC TV series about the Palace, the crowds viewing there either from abroad or the UK, have grown ever larger, and many will enjoy taking home a souvenir of their time. Although the Chapel itself is regarded by many as the Palace’s crowning glory, it is still used as a public place of worship with two musical services on Sunday afternoons. 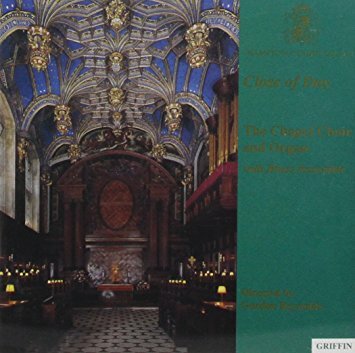 As the title assumes, this programme is from the Chapels’ repertoire for “evensong”, and includes such local specialities as Tallis’s Litany (settings of Cranmer) and Purcell’s Funeral Music for Queen Mary. Parry’s “Sunset and evening star” appears as does the Tallis Canon (God Grant We Grace) which Vaughan-Williams notably re-worked, also gentle dance tunes from Tudor times, and organ solos. There are 21 tracks and the Choir is either accompanied by organ or brass, and sometimes both together.